Oahu’s Stairway to Heaven is one of the most coveted hikes on the planet. There’s just one little problem; it’s illegal. We’re talking police helicopters, thousand dollar fines and even the potential of getting arrested if you get caught on the stairs. That being said, I am not going to tell you about hiking the Stairway to Heaven. Instead, I’m going to tell you how to hike to the top of the Stairway to Heaven where you can still get a fantastic view without getting in trouble. There is a back way to reach the top of the steps via the Moanalua Valley Trail. 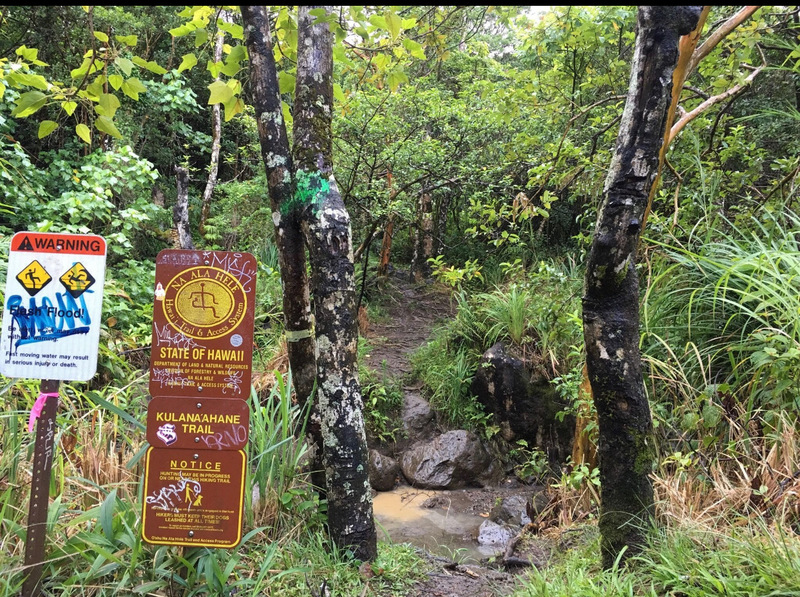 The Moanalua Valley Trail is a 9.3 mile out & back hike with a 3,050 foot elevation gain. I hired a guide for this hike because it is pretty treacherous at times and nothing is marked. His name is Mike and he would love to be your guide too. He charges $165 but also provides gloves and spikes for your shoes. Plus, he’s a professional photographer who will take pics and edit them for you! His info is at the bottom of this post. I left for this hike as the sun was coming up (around 7:00 a.m. in January). The first hour of the trail is very easy to hike. There are beautiful sights including bamboo and passion fruit trees. It is pretty muddy and that pretty much sets the tone for the rest of the hike. Once you get to a river bed with a flash flood sign (pictured above) you are going to cross the river bed. This is where we put on our spikes and gloves to prepare for the ascent to get more difficult. The trail is rated at the hard level and you will immediately get those legs working at this point in the hike. For a mile or so you are surrounded by trees so there is both protection from the sun and wind. That wind can get intense. As you get higher, you are more exposed to the elements and on the day I went, it was incredibly windy. I often crouched along the ridge because I really felt like I might get blown over! Definitely be sure to check the forecast before your hike. I certainly would not want to get caught up here during an actual storm! This quick video will give you an idea of how windy it was! 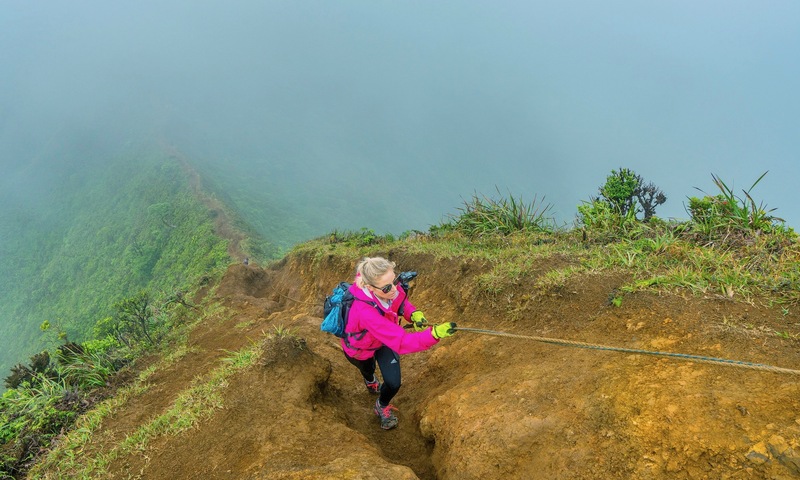 There are four areas where you have to use ropes to get up the steepest spots on the trail. This is where you will definitely want some gloves. For me, the parts where I needed the rope were the most fun but understandably this will make many people uncomfortable. The drop offs on each side are no joke and you need to be paying attention every step of the way. It was incredibly muddy when we hiked and my guide Mike said it’s usually worse! If you don’t use a guide, you would benefit from bringing your own set up spikes. It takes about 2 1/2 hours to reach the top. You’ll see an old bunker at the top. It’s actually really spacious inside so step on in and explore. It’s covered in graffiti and signatures from adventurers. It’s also nice to be sheltered from the wind. Opposite of the bunker are the actual Haiku stairs. Again, it’s illegal to use the steps but you’ll still see dozens of people coming and going on them. 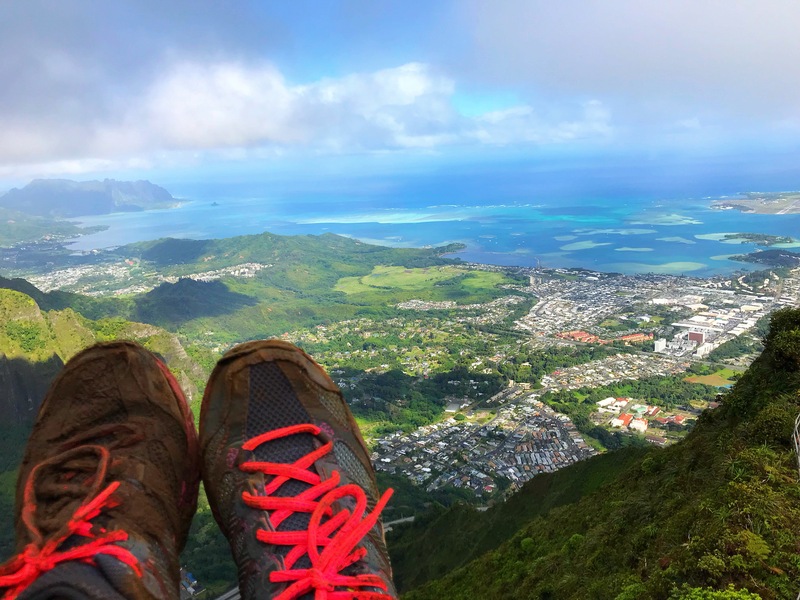 Without ever stepping onto the stairs, you will stail get a great way at the top of the Moanalua Valley Trail. It’s truly the most beautiful view I’ve ever seen. Seeing the bright blue sky blend into the ocean below is a vision that will stick with me forever. I truly hope you get the chance to try this trail on your own trip to Oahu. You’ll never forget it.